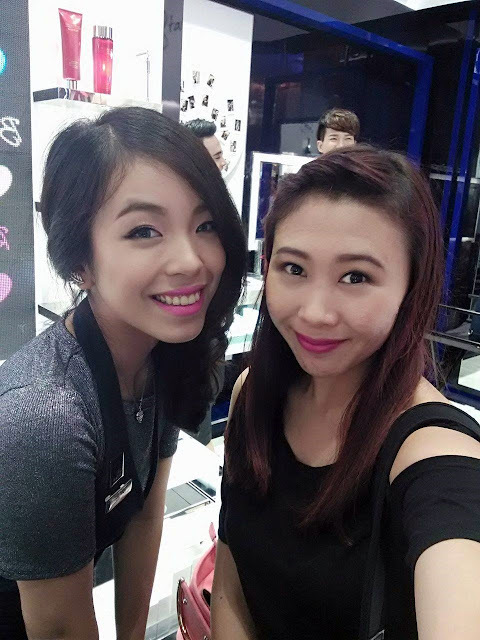 Last Thursday, Estée Lauder has finally launched their first in the world concept store in Sunway Pyramid. This new store is a mix of fun, refreshing and exciting offerings with a dedicated 'Dream Team' beauty specialist all ready to bring beauty to the next level. The store is located at Ground Floor, right beside an escalator with some nearby stores like Aeropostale, Innisfree and Bobbi Brown. Glow On - discover personalized secrets on having great skin by the 'Dream Team'. Glam Up - have fun with endless possibilities using colors to create unique makeup looks. Get Polished - complete your look with Estée Lauder's nail colors. Mix & Mingle - try out the latest fragrance and check out some cool gifting ideas. Strike A Pose - take a selfie against a digital photo wall to show off your brand new look! Chill with Kendall Jenner - check out Kendall Jenner's latest looks together with provided iPads and find out what her favourite products are online to inspire more new looks. Now let's take a look around the new concept store. As you can tell, Kendall Jenner is the current face of Estée Lauder with the 'it' girl personality and perfect features. 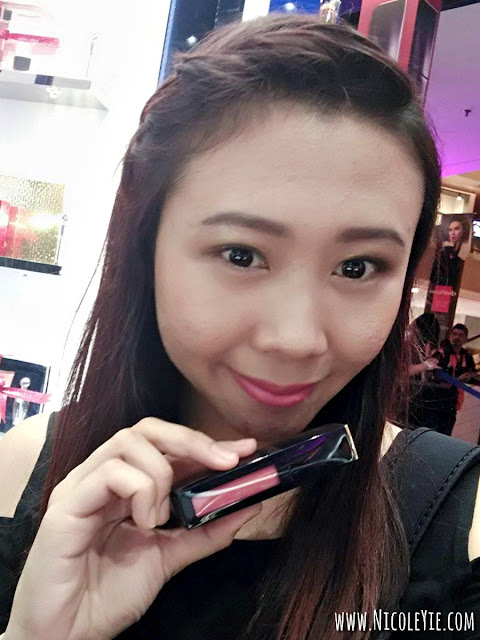 I was recommended to try out either their lipsticks or lip potion. So the beauty specialist Kaylee has brought me some gorgeous colours to try on me. These are the 3 favourite colours I've tried on. 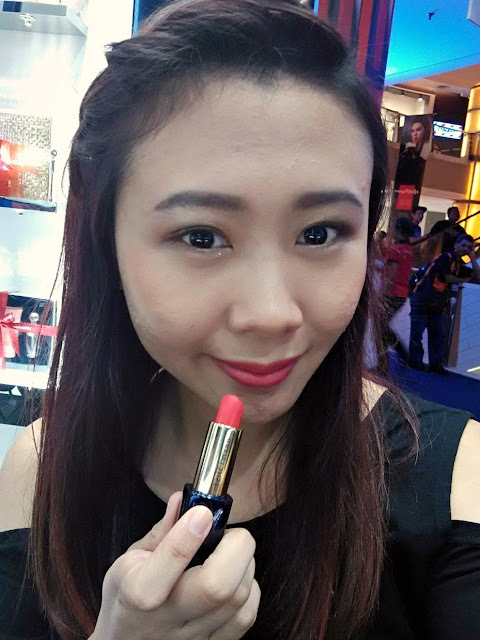 Wearing a natural light pink colour lip potion here. The texture is like WOW! And here I was wearing another peachy pink lipstick colour. With my assistant Kaylee. Look for her for advises cause she's really professional and friendly! Tried 2 colours and I'm falling in love with this blue colour! What do you think? You might have seen their fragrance all over the places cause they are really famous! Le Rouge is by far my favourite fragrance from them! What's special about this is you can select your preferred background based on your mood or style. Check out Kendall Jenner's latest looks together with provided iPads and find out what her favourite products are online to inspire more new looks. 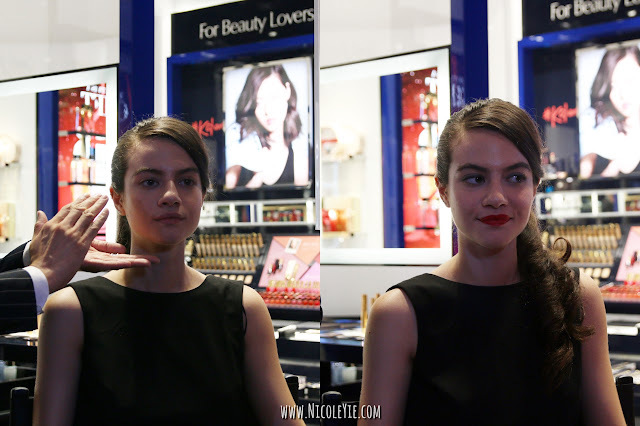 After we were given a tour around the store, there's a Kendall Jenner inspired makeup demonstration by Leo Wong, Estée Lauder Global Makeup Artist. Leo has given some advice in achieving Kendall Jenner's favourite makeup look with Estée Lauder's product. A few products that is a must have in this look is their BB Glow Highligther and Lip Potion because these are Kendall Jenner's favourite product. Make sure you give these products a try when you're in the store! The Kendall Jenner look, before and after. The model look super gorgeous! Leo Wong and The Model. I'm really sorry that I only blogged this on Saturday, which their great offers has almost come to the end. But if you're a big fan of make up products, make sure you take a visit by tomorrow (Sunday, 29/11) to the first in the world concept store by Estée Lauder! You're not gonna disappointed with their products cause it has officially become one of my favourite makeup brand! Lovely goodies from the launching event - Double wear Mascara, Eyeshadow palette, Advanced Night Repair Serum and Modern Muse Fragrance. Purchased the Lip potion with my own money because I just couldn't resist! Stay tuned for my review! Yes it is! Can't wait to pay them a visit again!